Vincent is Gilbert's younger brother by one year. As the Vessalius family found Gilbert, the Nightray family similarly adopted Vincent. His left eye is golden like Gilbert's, but his right eye is wine-red and his long hair is golden in color. He loves his brother Gilbert to the point of slight obsession. 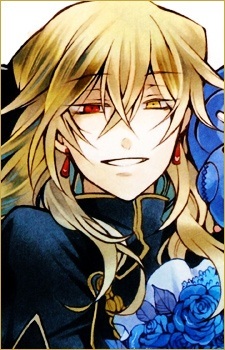 He has an easy-going personality on the outside and is often seen smiling; however, it is shown that Vincent also has a dark, unstable side. He has a habit of carrying around scissors and cutting up stuffed animals with them. Break is often at odds with him, which is fueled by Vincent sending Echo to attack Shalon. Vincent is from 100 years ago. In Alice's memory, a young Vincent is seen walking among corpses, gouging out eyes and intestines with a pair of scissors saying that "it's not his fault," because he was doing this to save his brother. He is also shown to be in alliance with the Baskervilles.